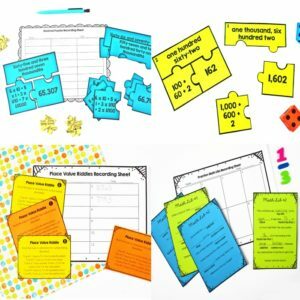 Last year, I shared my 5th grade math pacing guide and several of you requested an ELA one. 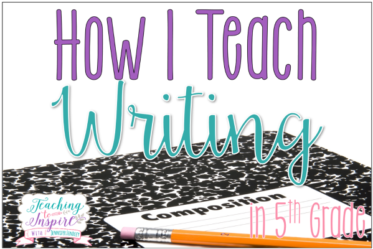 In this post, I will share a printable download of my 5th Grade ELA pacing guide using the common core state standards and some general information and rationale. This guide includes how I pace reading standards, language standards, and writing standards. Keep in mind as you view the guide and read the post, this is just a guide and sometimes we need to spend longer on some standards and sometimes my students’ interest and engagement takes us in a slightly different path. However, this is the pacing that I generally start with and follow through, with some adjustments as needed. Before I get into the pacing guide, I want to briefly explain my rationale and provide some general information that may help the pacing guide make more sense. When I pace my language standards, I always begin with a review of key skills from 4th grade that my students need a refresher on. Then, we dive into our 5th grade language skills. I chunk skills together that are related and I prefer to mix difficult and easy skills. I also always teach figurative language near the end of my narrative writing unit. This way, we can spend at least two weeks adding some really descriptive figurative language into existing stories and new stories. One thing that may be surprising is that I have never taught with a grammar or language textbook, and I only take about 15 minutes a day (15 on most days but I usually spend 30 minutes the first time a new skill is introduced) to teach, practice, and review my language standards. I do this using language packs that I created that specifically cover the standards. Using the packs, we spend the first day learning about the skill and gluing posters and completed interactive notebook elements into our language notebook. Then we complete our daily review which is about 4-6 questions specifically aligned to the standard. The next days we continue our review and use practice printables from the pack for homework. 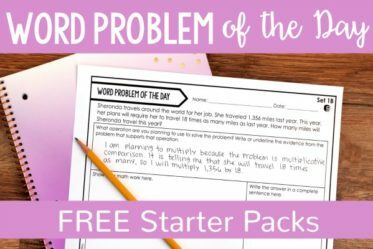 Click here to see the language resource packs that I use that contain everything you need to teach, practice, and assess the standards. Monday: Introduce the reading skill with an anchor chart and mentor text that aligns with the skill. Tuesday: Review the skill. Continue reading the mentor text (or read a new one) and practicing the skill. Wednesday: Introduce the skill in the format of a passage using my Reading Interactive Notebook. Thursday: Practice the skill with a passage that is both engaging and aligned to what they will on the state assessment (this keeps me from having to drill and kill for test prep. I weave this practice in regularly.) 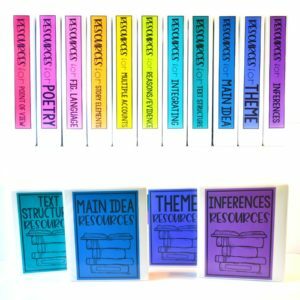 I use passages and other activities from my reading units which can you see in my TpT store by clicking here. Friday: Assess and reteach. I teach reading through guided reading, but on Fridays, I pull groups for reteaching and pause our guided reading groups. Note that the above breakdown is only for our 30 minute mini-lessons. For the rest of the block (60 minutes remaining), I pull three guided reading groups. In the guided reading groups. we work on highly targeted skills based on what each group needs, but I also try to cycle through previously learned reading skills as well. As I mentioned above, I align my reading standards with the writing genre that best aligns with them. 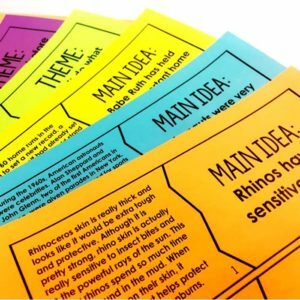 For writing, I teach primarily through Writer’s Workshops with mentor texts (often the same mentor texts used in Reading- click here to read a post about a persuasive lesson using a mentor text). We spend the first few weeks of school setting up our Writer’s Workshop and brainstorming seeds (or topics) that we will use the rest of the year in our writing. Sometimes I do give the students a prompt (often text based), but a lot of our writing topics are chosen from our seed notebooks. Click here, here, and here to read about some of my posts on brainstorming seeds. Now, for the pacing guide. 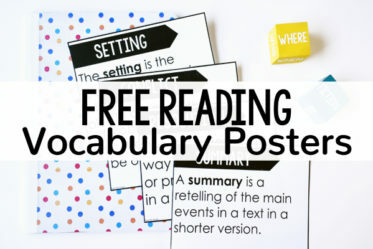 Click on the “Download Here” button below the image to grab a printable pdf version of the 5th grade ELA pacing guide featured in this post. 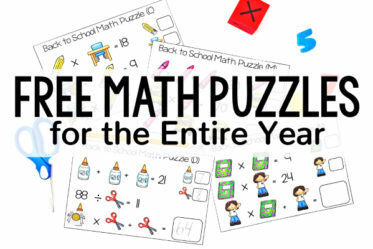 Don’t forget to check out the math version by clicking here. I loved reading about how you tie everything together. When I click the link for the LA pacing guide it takes me to math. Can you send the LA pacing guide to me? Thank you for sharing with all of us. Hi Kory, thanks for letting me know. I just corrected the link. Thanks again! I love this article and I would love to try it. Unfortunately the download here button takes me to the math pacing guide. Thanks for letting me know! I just corrected the link and you can download the Literacy pacing now. Sorry about that! Thanks again! Thank you so much for this resource and your comments. I am moving up to fifth grade from second next year! This will help get me started. Are the students reading independently after your minilesson for 40 minutes? Natalie, you are very welcome! To answer your question, I am working on a blog post right now that breaks down what my students do after the mini-lesson (which is actually 60 minutes). It really depends on the group of students that I have each year, but many of my students are not able to sit and read in an engaged way for that long. So, I often do reading centers: 3 rotations of 20 minutes each (which coincides with my guided reading group rotations). All of the students independent read for 20 minutes each day of a book of their choosing and then they complete two other centers. The other centers (which will be described in detail in the blog post) are very intentional and not busy work. They expose them to a variety of genres and allow for that much needed skill practice. The blog post should be all finished and posted on June 5th with all the details and several freebies! I look forward to the post! Do you have a 4th grade ELA pacing guide. I’m interested in 4th grade ELA pacing guide too. Thanks! THANK YOU SO MUCH FOR SHARING THIS.I am very curious about what you use as your mentor texts for Monday and Tuesdays. Are these chapter read alouds or do you use trade books? It would be helpful to have mentor texts that match up well with specific skills. Thank you for the freebie! I look forward to your next blog post about what you do after your mini lesson time. I actually use both. I use Wonder to teach a lot of my literature standards and then pull in trade books for the rest of the standards. I hope to eventually compile a list of all the trade books I use for each standard. Not enough time in the day. Thanks for your question! Do you have another recommendation for a great read aloud? One of our 4th grade teachers does Wonder. Thank you so much for sharing your pacing guide. My question, can the lessons linked with Informational Writing be taught prior to the lessons tied to Opinion Writing? I see the Opinion Writing lessons include standard RI5.1 about inferences from informational texts. You can definitely mix things up to fit your needs. The reason the informational standards are being taught in reading at the same time as the opinion unit is because there are way too many informational standards. Most of them don’t align well with the opinion writing, but I can’t justify spending 9 weeks of reading instruction on the standards that relate to opinion writing only. I start the informational standards in the middle of the opinion writing and this helps add in facts and details into our opinion writing and (more importantly) exposes them to a variety of informational texts to refer to when we start our informational writing. I hope this answers your question. As a 25 year veteran returning to the classroom after a 2 year admin stint and a 15 year district literacy coaching position, your work is just what I needed to get my wheels spinning in the right direction. Thank you for sharing it and in a bit of a way, collaborating with me from a distance. I hope your parents know how lucky they are to have you; let alone your students. Have you read Lester Laminack’s Writers ARE Readers? It reads very much like you teach and may even give you some new ideas. Best of luck for your upcoming school year. I love everything I’ve read about how you teach in your classroom. I also love your tpt products. Do you have a fourth grade ELA and/or Math pacing guide? Just subscribed and I LOVE your work! Can’t wait to look through your blog some more when I have some down time. Do you happen to have a pacing guide for 4th grade? For ELA? … I’m also just now seeing the comment above my own. 😉 Looks like someone else was already wondering the same thing. Thank you, Christin. Unfortunately, I don’t have a pacing guide for 4th. The pacing I share for 5th has been used and tweaked for the past four years. I wouldn’t feel as comfortable sharing a 4th grade one that I had not had the chance to use and modify. Thanks for asking though! Your website is awesome! I just love all your products. I recently move to 5th grade ELA, and your materials will help me a lot. I also love how you explain everything on your website. I will be purchasing many of your products. You are phenomenal! Your website is awesome! I just love all your products. 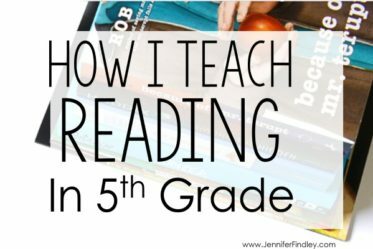 I recently moved to 5th grade ELA, and your materials will help me a lot. I also love how you explain everything on your website. I will be purchasing many of your products. You are phenomenal! You are an angel sent from above! I’m a novice non-traditional teacher, so my learning curve is quite daunting. My mentor is awesome, but teaches math/science; so needless to say I need some extra guidance. Thank you for this guide and the examples of setting up seed brainstorming journals for writing narrative, persuasive, etc. 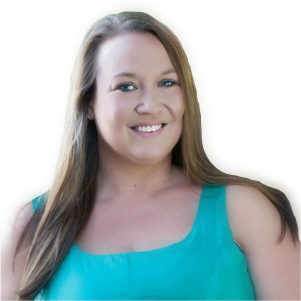 You and your blog are simply awesome! I am just amazed (and jealous) at how well organized and well planned your whole year is. I want to be that way. I know you aren’t middle school, but would be so curious your ideas of how to lay out a similar plan with only 50-55 minute classes a day to cover all three areas – reading, writing and language. I value your opinion and am desperate for some ideas. I used the warmup and first 10 minutes of class for language skills. Then I taught the focus reading skills and writing skills whole group Monday and Tuesday for the remainder of the time. I pretty much also integrated the writing into reading. Wednesday, Thursday and Friday was the same for language instruction but I did literacy rotations for the other 40 minutes, typically two rotations a day. My rotations were usually: computer (google classroom or our reading intervention program), reading skill practice (sometimes a review and sometimes the new skills if they were ready to practice. independently), an independent reading rotation, a language rotation that was usually super engaging, a writing station that was usually finishing up the writing we had started on Monday and Tuesday, and then my station which was the new skill of the week. Hope this gives you some new ideas! Do you have a list of mentor texts you use for 5th grade? Love your site, so helpful for my transition to a new grade. Thank you. I love your pacing guide! Thank you so much for posting. I was wondering if you taught spelling to your 5th grade class? This is AWESOME! Thank you so much for sharing your resource. It is a HUGE blessing. I’m moving from teaching 9th and 10th grade English (special ed) to 5th grade (all subjects/inclusion) this fall, so this has put my mind at ease. It is always easier to build and tweak something than start from scratch. Thank you! Thanks so much for sharing your work! 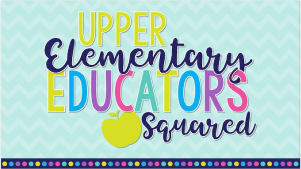 I am looking forward to using many of your resources next school year! I’m curious if you ever shared your mentor texts that align with your pacing guide? Thank you! Hello! I really like this idea and am planning to implement it in my new classroom this year. I’m new to 5th grade. I was wondering if you could share more on how you set up your Writer’s Notebook. Thanks! Hello! Thanks for this awesome resource. I have been teaching fifth grade for the past 6 years, but it is always nice to have an idea of what others are doing. Just out of curiosity, how much time do you have each day to lend to ELA? When you mention your 30 minute minilesson and 60 minutes of small group time is that only for reading? Do you teach language arts and writing at another time? I only ask because I am departmentalized and responsible for teaching both sections of fifth grade the ELA curriculum at my school. However, I only have 90 minutes a day to teach everything that ELA encompasses, so I typically focus on reading mon, wed, fri, and language arts/writing tues and thurs. As you can imagine, I often struggle trying to fit it all in, so I was just curious what your schedule reflected. Thanks! Amazing guide! Thank you very much. I will be following you! I was wondering how you incorporate or teach spelling? Do you have an editable version of this pacing guide? I love it! I want to add ideas from my units under each one. Thanks! Hi Megan, I just looked on my computer and it seems I have lost my editable copy. Sorry about that! I am contemplating moving from Kindergarten to 5th grade. I love all of your resources and I think your resources will be a tremendous help. Do you have a list of mentor books that coincide with the skills you are teaching? What books do you use for your guided reading groups? Thanks so much for all of your insight. This guide is wonderful. I too use First 20 days and LOVE it. You are a life saver. I have somewhere to start and a guide to follow. Do you have any more completed that I can purchase from you? Starting back in 5th gr this yr after 3 yrs away.